Weight weenies, move on. This isn’t for you. However, if versatility, durability and repairability are more important to you than a rack’s weight, the CroMoly steel Surly Nice Rear Rack is for you. Simple to fine tune to the best angle for your panniers and eliminate any heel clearance issues. Whether you’re a commuter, a tourist, or a utility cyclists, you can ride with through ice, snow, rain and blazing sunshine. This rack will resist rust and corrosion for thousands of miles. Superficiality aside, this rack is strong. Carry up to 80 pounds — your daily commuter load, your self-sustained-world-tour gear, or bundles of firewood (if you can figure out how to lash them to the rack). The Nice Rear Rack is height-adjustable, enabling it to fit a wide variety wheel sizes while allowing you to move its center of gravity as low as possible for a more stable ride. The platform is six inches wide, providing plenty of room for rack-top bags, rack-top cases, rack packs, and sleeping bags. 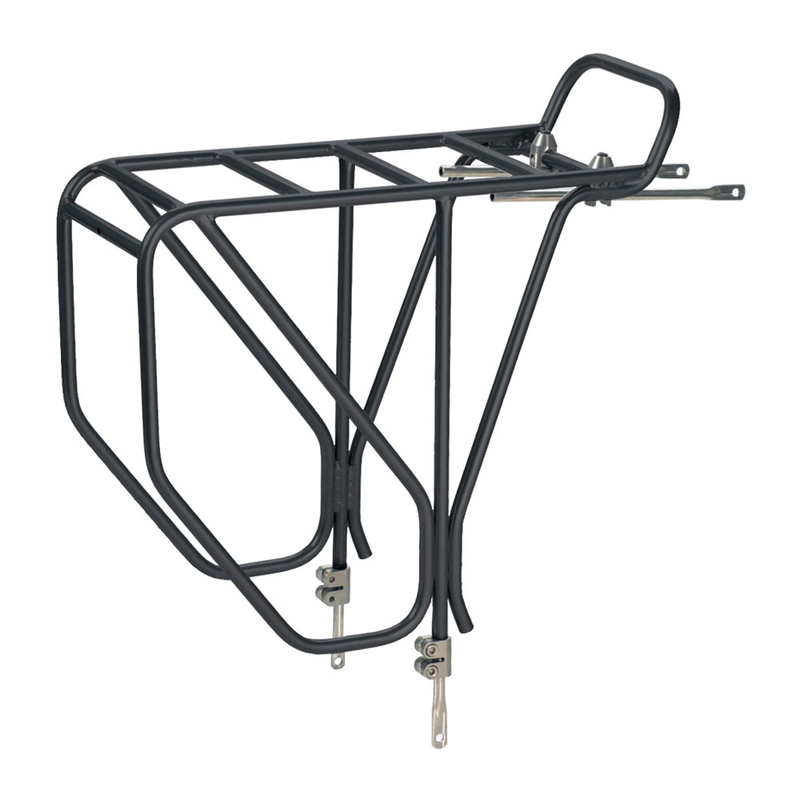 The stainless steel hardware provided will enable you to fit the rack to most rigid 26″ and 700c frames. The main body of is made of tubular CroMoly steel. In the rare instance that this rack breaks, you should be able to find, even in the most remote regions of planet Earth, somebody to TIG, MIG, stickweld, braze or solder a this rack back together. An aluminum rack won’t afford you the same luxury. Surly includes all the hardware not to confuse you, but to allow fit versatility between many different types of frames on the market. The rack height is adjustable, so it will fit onto most road and off-road frames that utilize 26″ 29″ wheels. Disc brakes and rear suspension are generally not compatible with Surly rear Racks. For more information, refer to the Surly Nice Rack Instructions. Excellent would definitely order from Bikeshophub again. Thank You. This is the only rear rack I would use they are made super strong and it fits my Surly Disc Trucker.This is the third rear rack that was made for Surly bicycle I love them. This rack is well built, well thought out, and it looks sharp. Installation was quick and easy. I love the rack. I have also purchased the Surly front rack. Very happy and id recommend these racks and Bikshophub.com to everyone! I have multiple bikes, and I believe you get what you pay for. When riding part of the GDMBT the last thing I wanted to think about was a rack that would not hold up- during that ride and in the future. This is my second rack, now one on each bike- couldn’t, be happier.